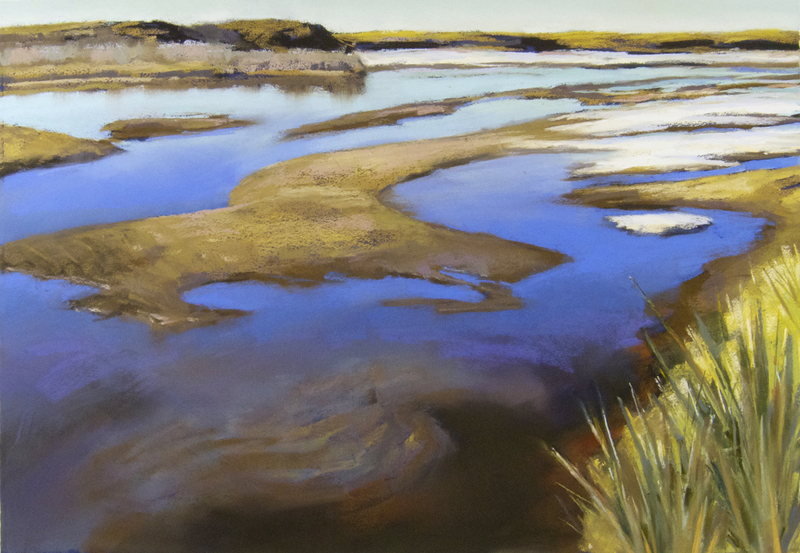 Late day light on the Canadian River- pastel 18.5″ x 12.5″. This spot is on the property of a sand company in Goldsby. The owner turned out to be a really nice guy who didn’t kick us out, and invited me and my artist friend to stop by anytime and paint. Sometimes it pays to look harmless. Studio painting, by the way. In my townie neighborhood, a small stream trickles through masonry walls on a bed of cement. A heavy downpour doesn’t call it to life so much as flush its trash down the sewer. The city has constructed a path along a short section of this rivulet, and a small trestle bridge allows the fiction of a nostalgic river crossing. When I clunk over its wooden boards I always peer down the concrete canyon, trying to find something alive in the skim – weeds, minnows, even a tadpole. Once, I saw a roadrunner down there doing the same thing. The streambed is as clean as a water trough. Pond scum on the Chickasaw, August. Water was really down and you can easily see the 1930s CCC-built rocks in the river. 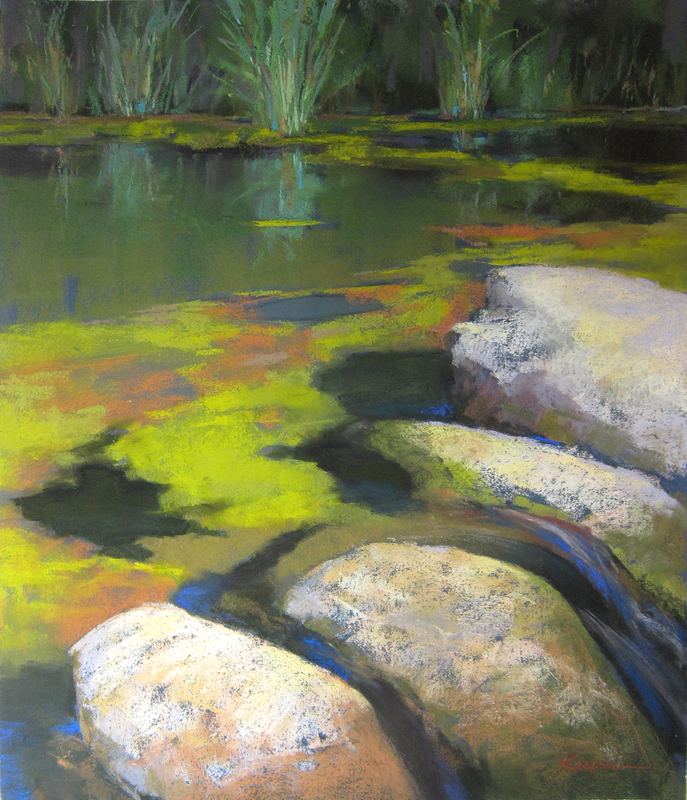 Plein air, 19″ x 15″, pastel. Oklahoma is not noted for waterways, unless you recall that the Cimarron, a great river, is an old west icon of cattle drives, pioneers and Glenn Ford movies. Or take the Canadian River. Like a hopeful ingenue, the Canadian gets both a face-lift and name change as she travels through OKC. She’s been straightened, channelized, and officially renamed the Oklahoma River along a 7-mile stretch. For propriety’s sake, noodling is strictly prohibited on the Oklahoma (but permitted downstream from the 10th Street Bridge). When she hits the city limit, the Oklahoma River sheds her corset and lets her sinuous banks go wild. Her name changes back to Canadian. On the Canadian River. We pondered how to capture this scene until the owner, brush-hogging nearby, invited us to crawl under his barbed-wire and set up our easels at the river’s edge. A bald eagle circled overhead while we painted. 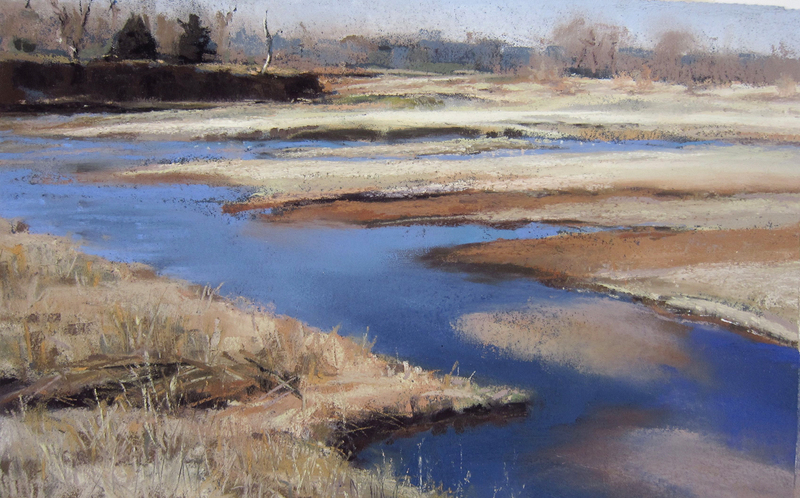 Plein air, 11″ x 7″ pastel. A great hidden secret of Oklahoma is its free-running rivers. Even in drought, they are beautiful, winding, primitive and splendid with wildlife. They hold reserves of blue-winged teal, alligator gar, catfish, ebony jewelwing damselflies. Least tern and snowy plover nest in sandy bays. Whooping cranes stopover for food and sleep. Marsh wrens ratchet rudely in the rushes. 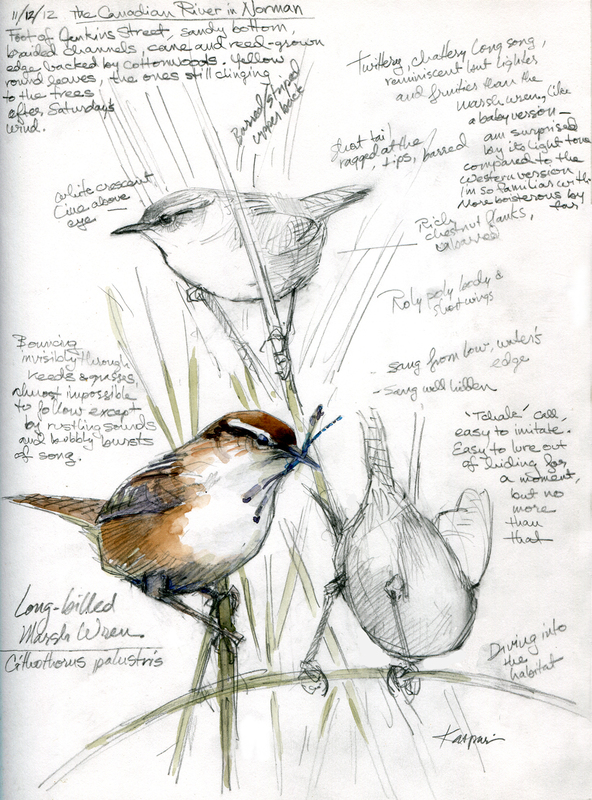 Marsh Wrens, Canadian River. The landowner welcomes birders, turns back most everyone else. His black angus bull didn’t like me much, though. Watercolor over pencil in Stillman & Birn Epsilon sketchbook, hardbound 8 1/2″ x 11″. One minor hitch to all this native beauty: you can’t get there from here. All the rivers around Oklahoma flow mainly through private property. It’s both a bane and a preservationist’s blessing- out of sight, out of mind, no one there to bother the birds. But access is frustrating difficult, especially if you’re an artist, or a birder, or just someone who wants to wet a line (or noodle a flathead). You have to know someone with a view, basically. Unless you drive across a river and grab a quick look, you can hardly see it and pull-outs are often lacking. If you’d like to see a nice spot on the Canadian River, copy and paste these numbers into the search bar in Google Maps, without the parenthesis. (Mustang Road Canadian crossing @35.325875087261025,-97.72390365600586) Then drag the little person icon onto the bridge to see it in Street View. And watch for traffic. Buffalo Creek, a branch of the Cimarron. I came here as a guest of Sue Selman, rancher and a living part of the area’s colorful history. And a great cook. Studio pastel, 18.5″ x 13″. The white stuff is pure salt, at least a foot deep. Good gracious, woman, is there nothing you can’t do beautifully? 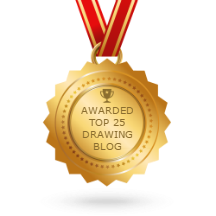 Your writing is fantastic, and your art in every medium is divine. There’s always something spectacular on your pages…I love stopping by to see what’s new. Thanks, artybecca- please stop by again, and thank you for the lovely compliment. Hi Debbie – Larry Carter from Noble. We met recently in John Brandenburg’s figure studio. 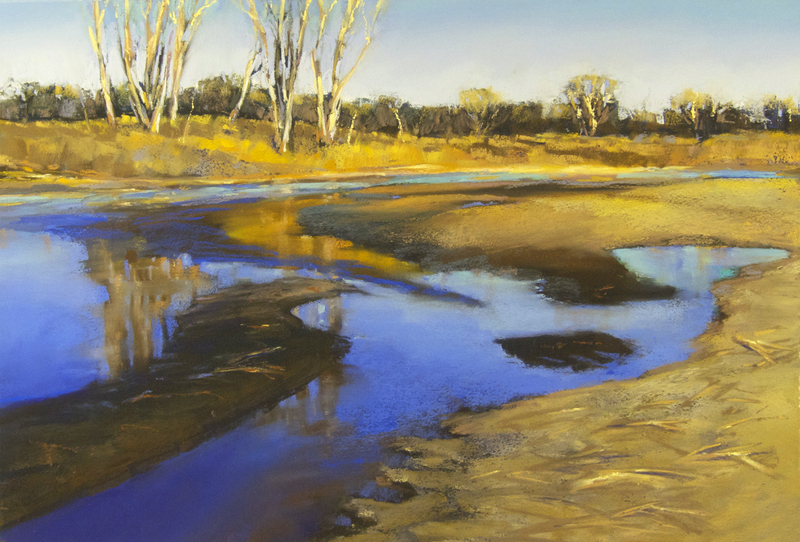 I love your river and creek paintings! As for river access, my sister and her husband have South Canadian River access on their property about six miles south of Noble, via their private 4 wheeler trail. My wife and I rode our 4 wheelers there today. I’d like to try plein air painting there – let me know if there is a time you would want to coordinate and paint. Hi Larry- wow, thanks for the offer- I’ll get in touch with you and see when we can set it up. That sounds great! Today I post in celebration: to creation, to serendipity, to art, and to the friendships that form within the kinship of nature. I met a fellow blogger today, a true renaissance woman and an artist of absolutely unfathomable talent. We, both Oklahomans for the moment, are drawn together by birds and blogs, the lure of distant places, and our deep connection to the natural world. I don’t ever remember being as overwhelmed by pure, raw, genius talent as I was today. Her sketches, drawings, prints and paintings inspire unbridled rapture. I am still reeling from the breathless, visual stimulation of her prolific creation and I am so grateful that she gave up her time today to share that with me. She has a keen eye for beauty and has created a life to match there in the cross-timbered hills of Oklahoma. So to you maestro– thank you so much for one of the most beautiful afternoons I’ve had in a long time and certainly the most fantastic afternoon since moving back. The color you bring to the world is a remarkable gift; the light you hold within is patient and kind. I hope there is a little room on your canvas of time to sketch me in — and I look forward to future adventures in the beautiful outdoors and rolling hills of our Oklahoma. Thank you, Catharine- they are the loveliest little birds, too.